"The technician who came to do a check on our system, Dan Bemman, is a wonderful ambassador for Ayers. He took the time to explain..."
"The crew was very knowledgeable about their job. Thank you Ayers Basement Systems, we are so thankful you're here." By Norma And Gary S.
By Judy & David M.
"We would give 6 stars!" We would give 6 stars! I just wanted to say what a great job Dan Bemman and Rich Wallace did yesterday on a service call to my home. Both are outstanding individuals that understand customer service. They represented Ayers well and lived up to the claim you made to me when I agreed to have you do the work on my crawl space. That claim was that Ayers operates with the utmost of integrity, believes in and stands by its product, workmanship, service and most importantly its customers. You want your home to be safe and secure; Dan’s goal is to ensure it is by leveling and lifting any uneven concrete. Bringing a comprehensive, personalized approach to every job, Dan will evaluate your areas of concern and provide a solution to quickly and effectively stabilize your sinking, settling concrete. Dan’s customers recommend him and the Ayers Team to their family and friends. Dan attended Denver Automotive and Diesel College and Oakland Community College before beginning projects to help others build homes in his community. He has special training in confined space and hazardous materials, in addition to earning the Institute of Inspection Cleaning and Restoration Certification. Dan also completed extensive training to evaluate your waterproofing, foundation, and crawl space repair needs. In addition, as part of the service team at Ayers, he responds if you need help after installation and to do annual maintenance. “Each home is different. Working with families to find the solution that addresses their unique needs is the best part of my day!” Dan said. He lives in Laingsburg, Michigan with his wife, Tammi. Dan enjoys working on his jeep and doing home improvements, as well as boating, water skiing, fat biking, and camping with friends. When spring time comes, it's hard for old and outdated crawl spaces to keep up with all the precipitation that us Michiganders know and love. With a little help from Ayers, we can transform your crawl space to save energy costs, reduce humidity, as well as control those creepy crawlies who are fans of your current crawl space. Using a vapor barrier called CleanSpace, we separate the ground and your home which in turn reduced humidity. On the walls, we installed SilverGlo panels which help to insulate the space. To top it all off, we recommend a dehumidifier in the crawl space to truly elimate any chances of mold, or dust mites that are caused by humidity. In this case, we used a SaniDry Sedona to finish the job. With all of these additions, our customer can start seeing noticeable savings in energy costs. This homeowner was experiencing musty smells throughout their home and mold in the basement. In addition to the Drainage Matting that allows water to flow freely to the sump pump, this homeowner added a CleanSpace vapor barrier and SaniDry dehumidifier to keep the moisture out and eliminate the mold and nasty smells. The sloping crawl space seen in the before photo was in need of an encapsulation, badly. The owners had already seen mold and standing water present. Lucky for the owners, they had used Ayers for foundation repairs in the past and knew that crawl space encapsulations were just another one of our specialties. The white liner in the after photo is our CleanSpace Vapor Barrier. As you can see, the barrier was used to cover the entire crawl space dirt floor and part way up the walls. For the rest of the walls, the crew used our SilverGlo Wall panels. The silver panels are insulation that reflects heat back to its source. By regulating moisture in the crawl space, this will help rid this home of its past mold problems. A homeowner from Lansing called us about his basement wall that was not perfectly straight anymore. He was very concerened so he wanted our professional help. We came to his property and installed wall anchors. Wall anchors are perfect for return the wall back to its original position and reinforcing the whole foundation. We install these by digging a tiny hole in that are a few feet away from the home. Then we drill a steel rod through a 1 inch hole in the basement wall. After that, the rod connects to an anchor that is placed in the hole of the soil. Once we place the plates on afterwards, we have permanently stabilized the basement. So now the homeowner doesn't have to worry about an unsafe basement ever again. When it comes to waterproofing products, reliability is everything. As a homeowner, you want to know that your basement will stay dry no matter what. Unfortunately, just having any sump pump isn't going to do the job. You'll need a reliable sump pump. The SuperSump Upgraded this home to a more reliable pump. The SuperSump contains a pump stand (prevents clogging of any debris in the sump liner), pump alarm (for when the basement floods), and an airtight sump lid with a floor drain in it (helps water to go down but not air to come up). Now this homeowner can rely on her sump pump to get the job done right. We had taken a trip out this Lansing, MI home last year to install a WaterGuard perimeter drainage system. The owner called us back out a few weeks ago to see if we could do something for her block walls, as well. While the leaking water was no longer puddling on the floors, the walls that the water ran down had definitely seen better days. Ayers has the perfect product to get rid of old water stains and make sure they don’t reappear on the next set of walls either. The crew attached our BrightWall rigid plastic panels in front the stained stone walls. BrightWall panels are made from inorganic, mold resistant plastic and can be put in place without a lengthy or invasive installation. Once the panels are set up, any leakage will happen behind the walls and out of sight. The water will then be directed to the WaterGuard unit that sits at the foot of the wall. It’s the perfect product to give your basement full protection from leaks without being distractingly ugly. Window Wells offer an attractive alternative to ugly basement windows window, while providing a safe, code-compliant basement egress. Our egress windows allow more natural light and fresh air into the basement to make the space feel larger and more inviting. After noticing water puddles and signs of mold, this crawlspace could no longer be ignored. To prevent further mold growth, this homeowner opted to have the CleanSpace Vapor Barrier system installed. This will block any future moisture from entering the crawl space and stop the growth of mold. 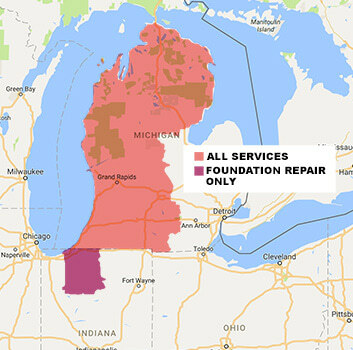 One customer in Zeeland, MI needed help with the foundation of their sagging floors. Previously, this home was using wood columns in the crawlspace to support the floor above it. Wood columns will never do a great job at supporting the floor. They are not adjustable, they cannot support heavy loads, they are vulnerable to molding and rotting, and they do not provide a long-term solution. We knew exactly what to do to fix this foundation, we installed the SmartJack system in this crawlspace to provide this home with a long-term solution to their foundation. This steel support system is ideal for the foundation of floors above the crawlspace. SmartJack is proven to support over 60,000 pounds, so you can rely on it to support your house very well. This is done by excavating a cube of soil where the SmartJack will be placed. Then, this hole gets filled with a strong concrete, then the base for your SmartJack is ready and will not need to depend on weak foundation soil to hold your home up. Thanks to SmartJack, this home will no longer need to worry about the foundation of their home. Our customer had an issue with a musty smell coming from their crawl space. This smell is usually from the presence of water vapor that can also cause mold and bacteria to grow. In addition to the smell, there was a small amount of water leaking into the crawl space from a pipe. We installed the CleanSpace vapor barrier, SaniDry dehumidifier, and SmartSump sump pump. The combination of these products will alleviate water vapor in the space, getting rid of the musty smell, and draining any water that enters the space.